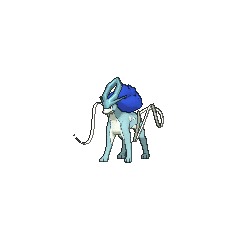 Suicune in game: 1,441 Who? Important notice! Pokemon Suicune is a fictional character of humans. The first lengthy appearance of Suicune is in Celebi: Voice of the Forest. In the course of the movie, it demonstrated its ability to purify water, as well as doing battle with Dark Celebi. 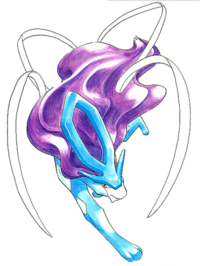 A Shiny Suicune appeared alongside Celebi and the other members of its trio in the thirteenth Pokémon movie, Zoroark: Master of Illusions. Suicune's first appearance is in the episode Don't Touch That 'dile when Ash, Misty, and Brock spot Suicune in the middle of a lake near New Bark Town. When it spots the group, it runs off. Its first significant appearance is in the episode For Ho-Oh the Bells Toll!, where it appeared in Ecruteak City after one of the Crystal Bells from the Bell Tower was destroyed. Suicune also appears in Sinnoh in Drifloon on the Wind!. It was a friend to two young Joys named Marnie and Paige. Suicune saved Ash and Paige's lives. Suicune also has a small cameo at the opening of Destiny Deoxys, Lucario and the Mystery of Mew, The Rise of Darkrai and Arceus and the Jewel of Life. A wild Suicune appeared in Ecruteak City in The Reawakening. Suicune appeared as a beam of light in Slugging It Out With Slugma. It wasn't officially seen until Querulous Qwilfish where it had cured the baby Qwilfish Crystal had rescued and cleansed the sea water. It appeared in Really Raikou & Entirely Entei I, joining Raikou and Entei against Falkner and afterwards discussed with them about Ho-oh. It was revealed in a flashback in Hello, Lickitung, where it was awakened by Yellow along with its two counterparts, and the three raced around Kanto and Johto looking for Trainers to help them defeat the Masked Man to free Ho-Oh. 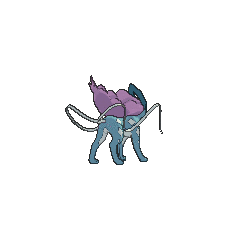 Suicune, in particular, personally challenges many of the Gym Leaders in the two regions. During its travels, it encounters both Eusine and Crystal, both of which become obsessed with capturing it. Eusine acquires the Crystal Bell from the Rocket trio he defeats, but he and Crystal are still unable to capture Suicune. Crystal has her confidence shattered by this (and by the guilt of interrupting Suicune's attempt to contact its old master) and has to retreat back to her old training grounds to regain her confidence, which she does by reacquiring her catching skills capturing a wild Larvitar. Suicune later chooses Misty as its partner and fights alongside her, but then pairs up with Crystal anyways after Misty becomes injured (much to the dismay of Eusine). Suicune can communicate with Raikou and Entei telepathically. An ice sculpture of a Suicune appeared in Mahogany Gym in Irked Igglybuff and Curmudgeonly Cleffa, where it started to move and battled against Whitney and Pryce. It was later destroyed in Savvy Swinub, were it was revealed to Whitney and the Radio Crew that Pryce uses it for battle practice. Pokémon HeartGold and SoulSilver: As in Crystal, Suicune will roam Johto and Kanto before finally battling the player. After being first seen in the Burned Tower, it runs to Cianwood City, Mt. Mortar, Vermilion Harbor, and Route 14 before giving itself up at the end of Route 25 after defeating Misty. If it is not caught, Suicune can be found in the Burned Tower after defeating the Elite Four again. 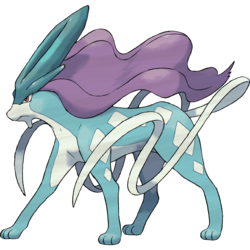 Suicune's moveset was changed between Gold and Silver Versions and Crystal to remove Roar, as it became a stationary Pokémon. 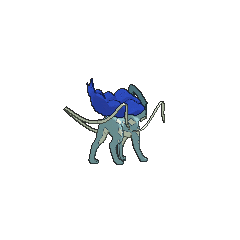 This change carried over into later games, making Suicune the only one of the roaming trio that cannot Roar its opponent away in FireRed and LeafGreen. It returned to its Crystal status as a stationary Pokémon in HeartGold and SoulSilver. 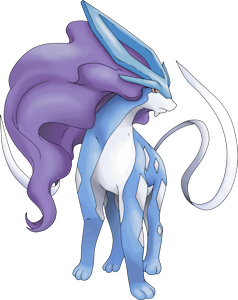 Although Suicune is part of Johto's Legendary trio, it is battled in Kanto in HeartGold and SoulSilver. Moltres has a similar situation, but in reverse. However, unlike Moltres, if Suicune is knocked out on Route 25, it will return to the Burned Tower in Johto where it can be re-challenged. 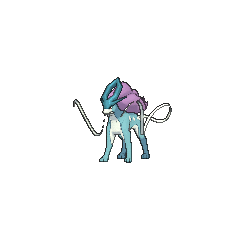 Suicune is the only member of the Legendary beast trio that does not require the Mystery Part or Secret Slab to appear to the player in Pokémon Mystery Dungeon: Explorers of Time and Explorers of Darkness, instead appearing in the Final Maze. Suicune is the only Legendary beast that does not have a unique effort value yield. Suicune is thought to be based on numerous creatures and mythological deities, mainly the Qilin or "Kirin", an Eastern legend that has traits of chinese dragons, unicorns, deer, big cats, and other beasts. The Qilin was said to be able to walk on water and is known to be a powerful and peaceful creature. The crest on Suicune's head roughly matches the description of the beast's antlers. 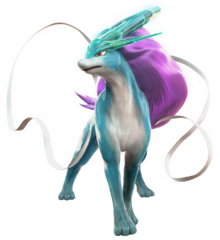 The spots of Suicune are also significant, seeming to combine the spots of a leopard, taking homage from Fūjin, the Shinto fake of The North Wind, who wears leopard skin. Leopards themselves are found in Asia and are featured in myths that show it is a widely respected sacred animal like the Qilin. The way it runs and roars in the anime may also relate to the leopard. Being a Pokémon that represents the wind and rain, Suicune may also be based on some of the world's numerous myths of wind deities. Suicune's mane is meant to resemble a northern aurora.